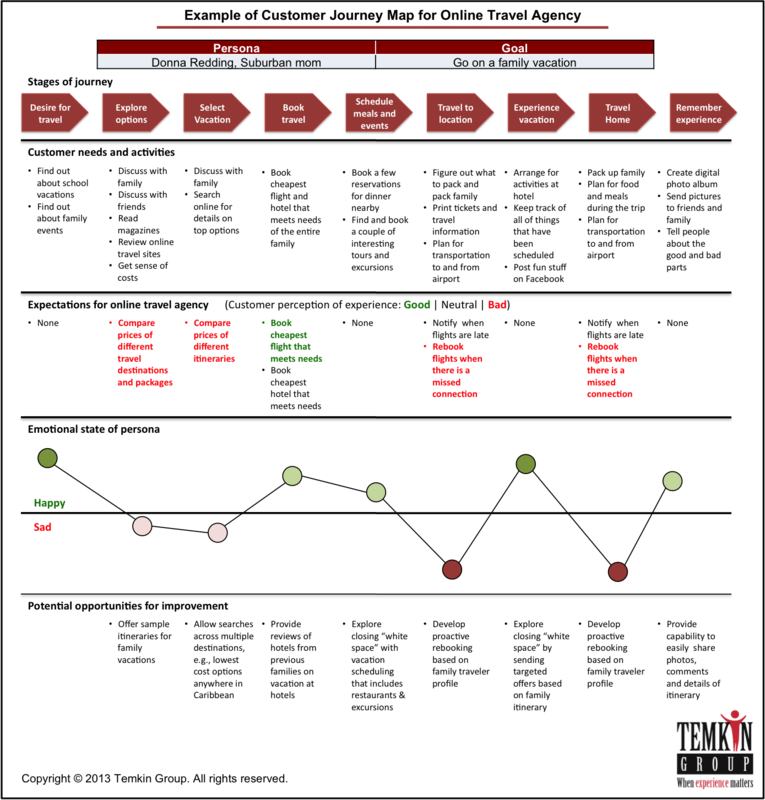 In Temkin Group’s previous report on B2B CX best practices, we provide examples of companies using a customer journey map (CJM), which is a critical CX tool. We included this graphic which is valuable for any company, B2B or B2C, that is thinking about using CJMs. Here’s an example of a CJM we created to showcase the power of CJMs. Note how the journey represents the customer’s point of view and not just the company touchpoints. Often times, companies mistake a CJM for a touchpoint map, which is looking at individual interactions or “touches” with customers. The problem with this approach is that it often loses the broader context of how that touchpoint fits within the overall goal and objectives of the customer. As a matter of fact, mapping internal touchpoints is one of my 10 CX Mistakes to Avoid. Do we need to do customer research? No, but it is much better if you do. If you assemble the right front-line employees who have day-to-day interactions with customers, then your CJM may be somewhat accurate. But very likely it will be missing some steps and perceptions of customers, especially in areas of the journey where the customer doesn’t think about the company. And if you just pull together a bunch of people in headquarters, then your CJM will often represent an oversimplified, fantasy about what customers go through. The best CJMs start with internal information to frame the effort, but spend the time to validate and update the CJM through strong customer research. What type of customer research do we need to do? This is all about qualitative research. You won’t find how customers feel about the journey in your quantitative datasets. You will need to go out and speak to customers within your different segments to understand how they view the overall journey. This can include ethnographic techniques like journaling and contextual inquiry. After you have the journey defined, you can use some quantitative methods to identify how often some activities occur. Do we need to hire an outside firm to do a CJM? You don’t need to, but there are some good firms with a lot of experience in this area. If your internal research organization has strong ethnography skills, then you can probably follow our seven steps above and complete it on your own. As with any activity, the vendors that have done a lot of these are going to be more skilled at the process and in making sure that the output is actionable. If you can’t afford to hire an outside firn, then it’s still worthwhile to go ahead and do the project internally as best as you can. Is there a CJM that we can copy? There are a lot of examples of the physical maps, but that’s not what’s important about the process. You are doing CJMs to uncover specific insights that you will use for fixing problems, wowing customers in the future, or establishing measurement tracking systems. If you focus too much on copying someone else’s CJM, then you will often miss the nuances that are key for your customers and your company. And, more importantly, you lose the institutional learnings that come from going through the process. Do we need to do a CJM for every customer segment? Yes, at least every important one. It may be that some of your customer segments follow the same journey, in which case you can combine them but you don’t want to have CJMs that are an amalgamation of multiple segments. You’ll end up with a bunch of generalities and less useful insights. It’s okay to have the output show one journey with different variations after you’ve examined each segment individually. Are CJMs for the entire lifecycle of a customer or for a specific stage? Yes and yes. CJMs can be used at different levels of the customers’ journey. They can examine how customers go through a multi-year journey like the car ownership experience to a more specific journey like going on a family vacation. Are CJMs good for finding mistakes to fix or for designing future state experiences? Yes and yes. CJMs can be used to identify gaps in the current state of experiences as well as helping to identify the opportunities for better future state experiences. Depending on your goal, you will likely want to adjust your customer research approach. How much detail do we need? It depends on what you are trying to accomplish. The maps shown above are at a level that would help point a company into specific areas for improvement. If you wanted to redesign an area such as rebooking a flight, then you would really want to get much more granular information about the customer journey in that area. Bruce Temkin, Managing Partner of Temkin Group, is a leading expert in how large organizations build differentiation with customer experience. He has worked with hundreds of large organizations on the business strategies, operational processes, organizational structures, leadership, and culture required to create and sustain superior customer relationships. 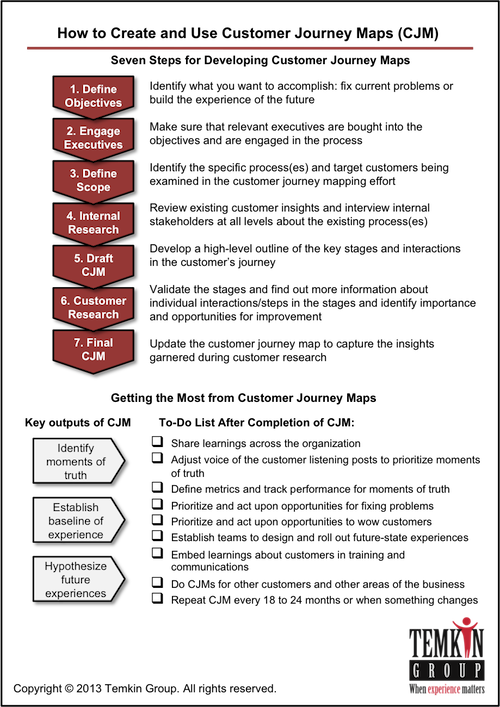 Another useful post taking customer journey mapping to the next level. I particularly like including the emotions within the map – thought I was one of only a few doing that! Thanks Bruce for your inspiring and generous sharing.